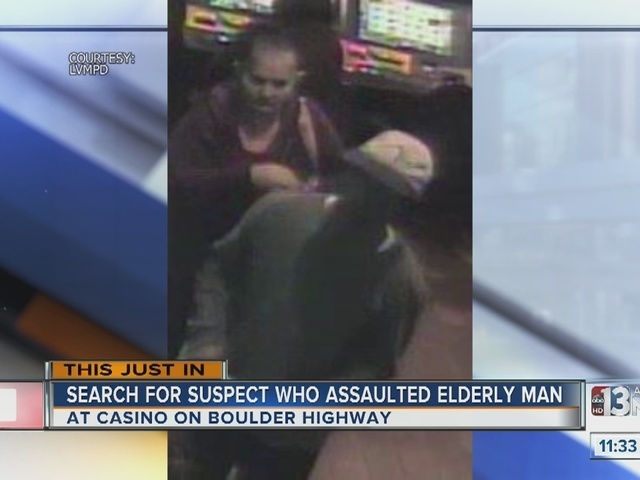 At the beginning of December, a disabled victim was sitting in a local casino on Boulder Highway when a suspect walked up and struck him in the head with a blunt object, knocking victim out of his chair. The suspect the exited the casino in unknown direction. He's described as a black male, 5'8" around 150 pounds with brown hair and brown eyes. The battery appeared unprovoked. The suspect was apparently in a conversation with a female prior and may be associated with her. She's described as a white female, 5'6", 180 pounds with brown hair and light-colored eyes. Anyone with information is urged to call Crime Stoppers at (702) 385-5555.